The 2017 AWDF Championship is now history! Each year, the United Doberman Club supports a Doberman team of UDC Members and also sponsors the High Doberman trophy at this national multi-breed event. This year, 34 dogs competed at the IPO3 level, three dogs competed at the IPO2 level, and and three dogs competed at the IPO1 level. The competition was held in Bowling Green, Kentucky. The judges were USCA/SV Mike Caputo (Tracking), SV Raino Fluegge (Obedience), and FCI Pentti Rapila (Protection). 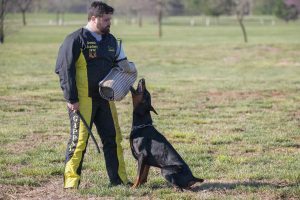 Congratulations to the UDC members James Cook and Simone Jeans for representing the United Doberman Club team at the 2017 AWDF Championships. 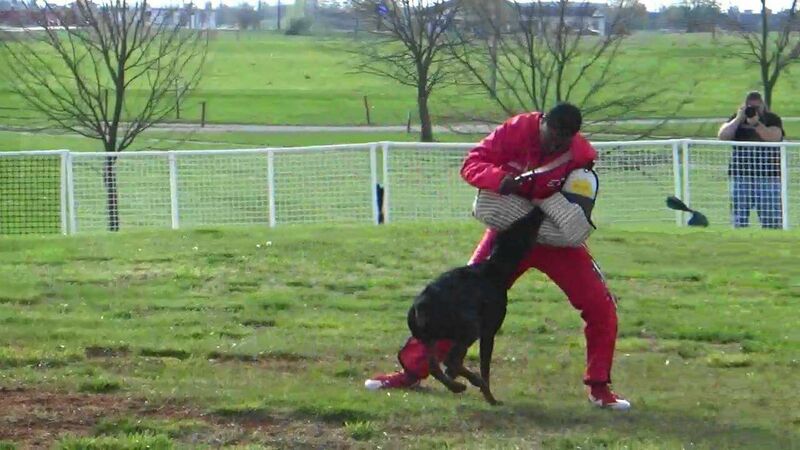 Stepping onto a multi-breed national event field requires strong character. The outcome is never guaranteed, no matter how well trained the dog and how well prepared the team. James and his dog Bogart, Masaya’s Casablanca Kid, bred by Brandi Williams of Masaya Dobermans, scored 46-87-80 at the IPO1 level. They had good performances in obedience and protection, but tracking was just not in cards for the two of them during this championship. We look forward to seeing James and Bogart on a national trial field in the future! Simone and her dog Kuno, Chalmar’s Ockham’s Razor, bred by Arnold and May Jacobson, qualified at the IPO3 level, with a score of 78-81-75. The bond between Simone and Kuno is incredible to watch, and we will be watching them and rooting for them as they continue to compete and improve at the national level. A team needs a captain, and UDC member Ashley Stursa stepped up to the plate this year to organize the purchase of team logo wear. She also attended the event to support our UDC team members. Many thanks to Ashley for volunteering her time to support our competition team! The UDC also wishes to congratulate Ally Smith and her dog Kovu, Ascomannis Tarzan, bred by Lisa Schuller, who took home the High Doberman Trophy sponsored by the United Doberman Club. This dog and handler team placed ninth in the IPO3 competition, with scores of 92-90-94. Their 94 protection score tied for second highest protection score in the event. We look forward to the continued success of this impressive team! 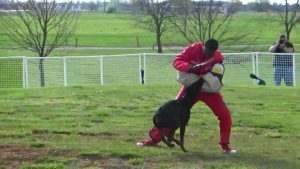 It was great to see a good entry of Dobermans on the field in 2017. If you are UDC member interested in representing the UDC, please review the rules regarding national and international team competition in Chapter 8 of the UDC Administration Manual (https://uniteddobermanclub.com/…/AdmManual_AllChapters_20170…).